When a tank is fermenting one of the things we do every day is measure the density of the juice. When we harvest the grapes they have roughly 250g per litre of sugar. Sugar is pretty dense so that gives a specific gravity of about 1100 compared to 1000 for pure water. The easiest way to follow the progress of the fermentation is to measure the density, because alcohol is less dense than sugar or water, so as the sugar turns to alcohol the density falls and when it gets down somewhere under 995 and stops falling then all the sugar has turned to alcohol and the fermentation finishes because the yeasts run out of food and die. We measure the density with a very simple tool called a hydrometer which we drop into a beaker of the wine, it floats more or less depending on the density and we read off the density measurement from the scale on the side. Simples! 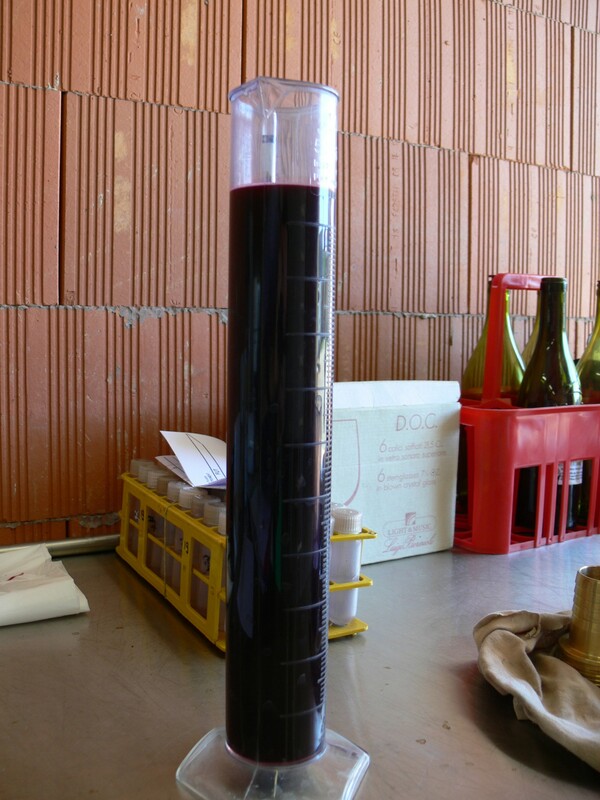 This is the Vinsobres Syrah that we brought in about 10 days ago and as you can see from the fact that the hydrometer is only just poking out the top of the wine it has nearly finished fermenting (998 this morning). As predicted we had a lot of rain last weekend and again mid-week (about 150mm in total), but the grapes are still healthy. Now it is sunny and windy and everything has dried out nicely so we will be harvesting again next week starting on Tuesday.